How portable is portable enough? When you’re dealing with most audio equipment, bigger tends to be better. It’s something you can notice when comparing the difference between the speaker inside a singing birthday card, the speaker on the back of phone, and the speaker on a full-sized TV. When sound quality matters, you want to go for the largest Bluetooth speakers that still meet your portable needs. But then again, sound quality may not be your top priority. As long as the speakers sound good, you might be more concerned with portability, battery capacity, and the like. Especially when you’re on a tight budget, these type of considerations can make a huge impact in deciding whether or not you end up with a speaker that’s well-suited to your needs. When you close your eyes and imagine a Bluetooth speaker, the object imagined by most people likely bears a striking resemblance to the Anker Soundcore Motion B Portable Bluetooth Speaker. It’s somewhat simple looking, as if a larger speaker had been miniaturized. Atop sits a fully intuitive touch interface. And given its somewhat humble appearance, it doesn’t seem like the Motion B would be packed with features. But looks can be deceiving. 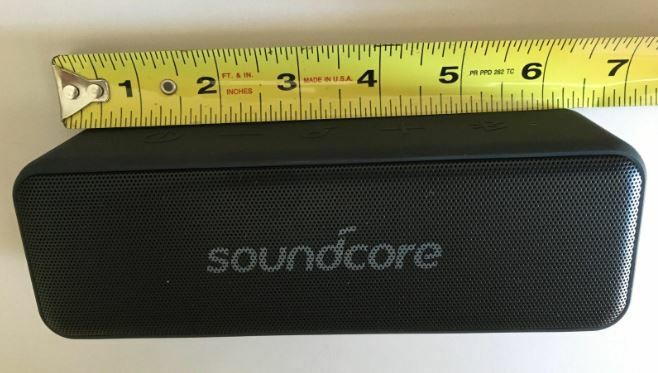 The Anker Soundcore Motion B Portable Bluetooth Speaker measures 7.5 x 3.2 x 2.6-inches, using an elongated rectangular design with smoothed edges. 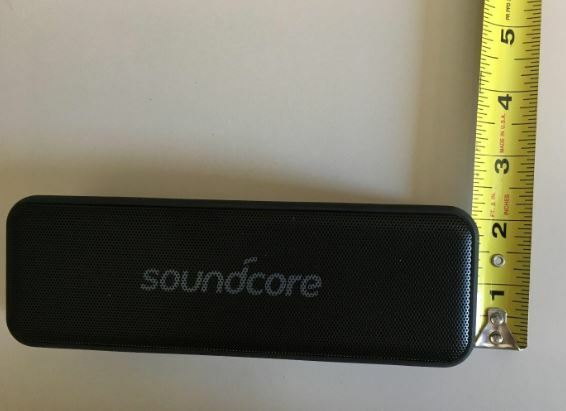 Held in average-sized hands, the Soundcore Motion B is slightly large, weighing just short of one pound. The bulk of that weight is due to its reasonably impressive battery, which we’ll get to in a moment. With respect to ease of use, the Soundcore Motion B is easy enough for a child to master within seconds. Along the topside, its large operational buttons are very nearly self-descriptive. The central-most button looks like a music note, and will play or pause your music. Adjacent to that, a plus button and a minus button, which will predictably raise or lower volume. And on each far end, arrow buttons can help you navigate through the content you’re listening to. These buttons are constructed with a tactile design that can be navigated in the dark, or even through a steamy bathroom after your morning shower. 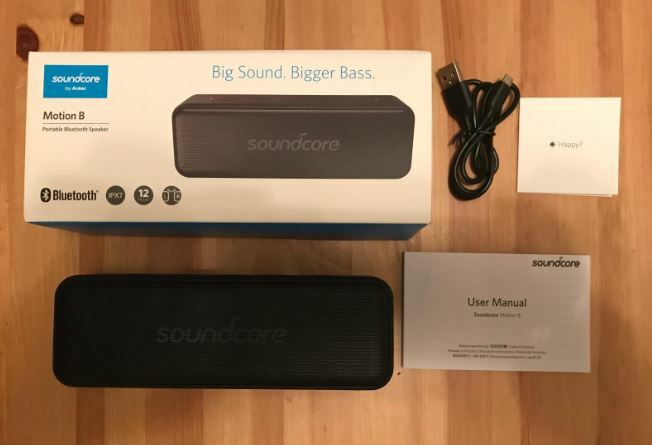 The general idea is that you don’t actually have to be looking at the Anker Soundcore Motion B Portable Bluetooth Speaker to be effectively using it. And the IPX7 waterproof protection provided by the Motion B ensures that your equipment is well protected from the possibility of a bathroom disaster. IPX7 is one of the highest waterproof ratings you can get without getting involved in deep-sea equipment. The Motion B is even able to withstand submersion within water for up to roughly three feet, so it’s generally safe to have around around pools and tubs. Imagine you’re holding the Anker Soundcore Motion B in your hands, and facing it away from you while playing music. On the left side of the Motion B, your fingers may notice a small hatch. Behind the hatch, port connections are tucked away safely, allowing for the included micro USB cable to connect and charge. But it’s worth stressing that the IPX7 waterproof rating does depend on that hatch being in-place. If you remove it and submerge the Anker Soundcore Motion B, you’re going to kill those ports almost immediately. 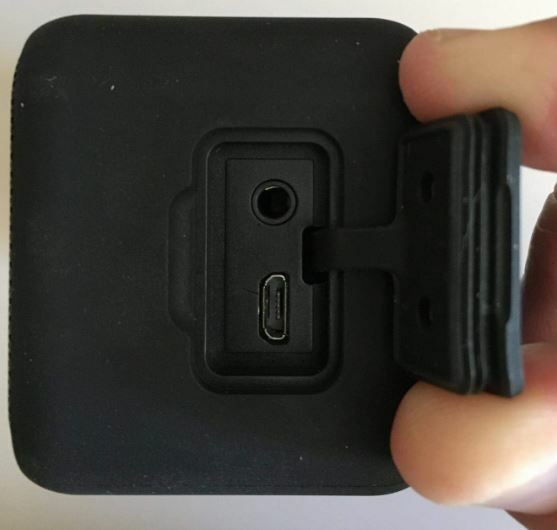 Anker makes this somewhat easy to manage with the tight connection made by the hatch, and the tactical feedback that ensures there’s a total lack of ambiguity as to whether or not the hatch has been sealed. Anytime you’re dealing with portable electronics, battery life is going to be a significant concern. And the 12W stature of this device may amplify that cause for concern. To help power those fairly large drivers, Anker has included a 2600mAh lithium-ion battery. It’s roughly the same battery capacity as a small notebook PC, and it’s capable of providing an estimated 12 hours of playtime. Of course, estimates vary. And whether or not you end up with 12 hours depends on everything from the weather outside to your volume. But in practical use, you should generally be hitting the 10-hour mark fairly regularly. That’s about enough to last through an entire day of playing, which ought to be sufficient for just about anyone on the job, headed to class, or traveling out into the world. 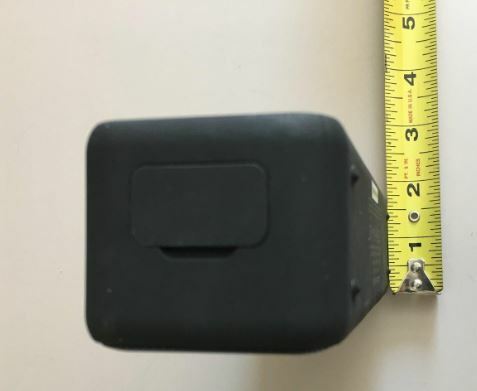 Another small detail is how the battery weight is fairly well distributed across the body of the Anker Soundcore Motion B Portable Bluetooth Speaker. In a lesser build, the larger battery would’ve created a top-heavy device, or a device that interfered with audio quality in the interests of placing the battery. These details generally go overlooked, but bad design is often the reason why your stuff tips over. 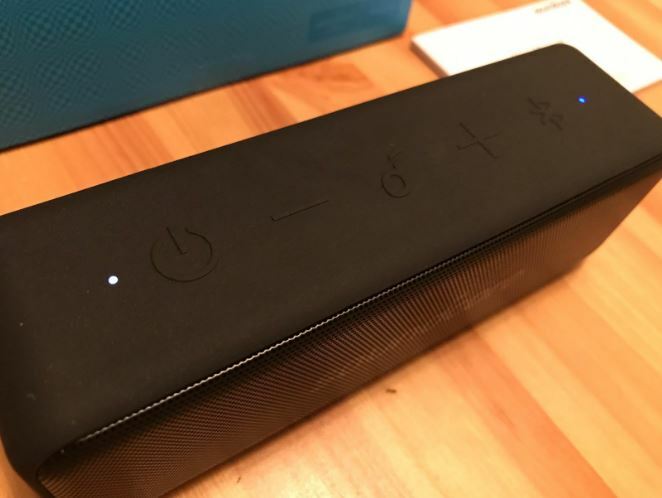 Unsurprisingly, the Anker Soundcore Motion B Portable Bluetooth Speaker does indeed connect through Bluetooth. It uses Bluetooth 4.2 for the most streamlined pairing you can get today. And it provides an extended wireless range of up to 66 feet in open spaces. That’s roughly twice the connecting distance of the last generation of Bluetooth audio equipment. Of course, within more constrained spaces, you’re looking at closer to 15-feet of connectivity. Don’t see yourself wandering 60-feet away from the source of your audio? You can still take advantage of the increase signal strength. It helps keep the Anker Soundcore Motion B in constant connection with your devices, even in a number of spots where standard 30-ft connections would suffer more severe issues. 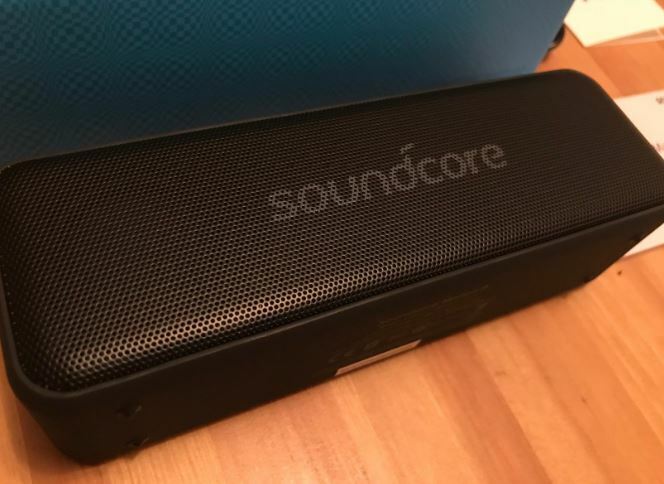 The Anker Soundcore Motion B is capable of playing rather loudly, especially relative to its fairly small body size. That booming sound is driven by powerful 12-watt, 1.75” dynamic-range neodymium drivers. This has a number if impacts on the Motion B’s sound. One of the more prominent ways is how it helps them keep tonal clarity steady as you raise and lower the volume. Anyone who’s owned a cheaper stereo before will understand the issue. One problem faced by all portable Bluetooth speakers pertains to bass tones. That’s because bass is best recreated with plenty of power and physical space. Portable Bluetooth speakers can generally provide neither. Like nearly all manufacturers of portable Bluetooth speakers, Anker has worked to resolve this problem by reinforcing bass performance artificially. These attempts can be hit or miss. It’s a particularly difficult task in this case because the Soundcore Motion B uses those fairly impressive 12W drivers. Those drivers help ensure the Anker Soundcore Motion B has excellent clarity in highs, and fairly rich mid-tones. But that creates a problem of its own. Whatever the bass response happens to be, the bass tones are going perceptually contrasted against the fairly high performance provided on the other ends of the spectrum. One way Anker went about solving this problem is by adding a passive bass radiator. That’s basically a sound engineering trick to capture reverberation created by the Motion B’s drivers, and translate that energy into bass. Anker made additional attempts to patch-up their bass tones with BaseUp technology. It’s a fairly simple software algorithm that analyzes your music to enhance bass based on what you’re playing. With those Band-Aids in place, the results are fairly good, relative to the bass you usually get out of portable Bluetooth equipment. But even though bass tones have overcome so many hurdles, they still don’t truly stand up on their own merits relative to the Motion B’s mids and highs. The bass could’ve been botched in several ways, at several points. It could’ve been bloated and unwieldly. Anker dodged many bullets, but for all their hard work, the bass they end up creating is essentially just passable. It’s not a source of disappointment, but that’s faint praise considering the amount of effort that was involved in its creation. As with so many speakers these days, the Anker Soundcore Motion B Portable Bluetooth Speaker is compatible with Google Assistant and Siri. It uses a single microphone, however, which ensures it’s not very good at listening to your voice through noise. If you’re playing your music near maximum volume levels, you even have to pause your music to initiate voice commands. Being in a boisterous room can make recognition difficult as well. This is part of the reason why there’s no support for Amazon’s Alexa or Microsoft’s Cortana. 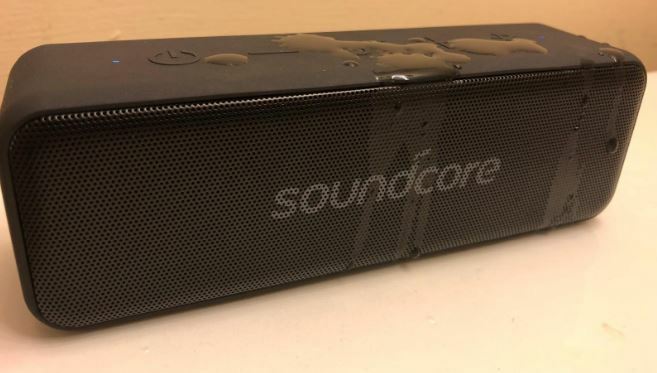 Another thing to keep in mind is that the Soundcore Motion B can be upgraded and expanded into new areas. Being able to combine several portable Bluetooth speakers to play content from one audio source isn’t a particularly new feature. But it’s noteworthy with the case of the Motion B because of the total 24-watts of portable power a pair would create. Anyone interested in filling-up somewhat larger areas with loud wireless sound should take note, as wattage will ultimately be one of the deciding factors in your ability to reach higher levels of volume. Audio equipment tends to be some of the longest-lasting types of electronics, and you generally don’t have to worry about speaker equipment failing on you. Even manufacturer defect rates are fairly low for speaker equipment. Nevertheless, Anker provides an 18-month warranty that’s worth consideration. Who Should Choose the Anker Soundcore Motion B? If you’re someone who’s all about bass, you can find speakers more suited to your needs. But with respect to achieving balanced sound quality, the Anker Soundcore Motion B is about as good as you can do without adding a zero to your budget. And its IPX7 waterproof protection keeps you well protected from dust, dirt, water, and debris. If you’re looking to add volume or dimension to your sound, you can add a second Anker Soundcore Motion B. That bit of adaptability as an added feature helps bump-up the Motion B to another level of convenience. All in all, the Anker Soundcore Motion B is a solid selection for almost anyone searching for a handheld, highly portable Bluetooth speaker.